No need to pack your bags because Homemade Coconut Granola is serving up tropical tastes, sans the travel outside your kitchen. 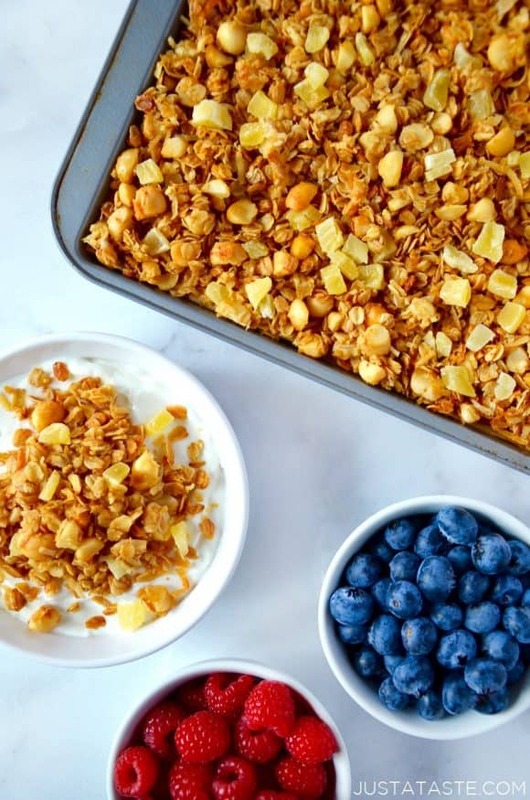 This flavor-packed twist on my go-to granola recipe stars plenty of shredded coconut, chopped macadamia nuts and dried pineapple. All that’s missing is the sand between your toes (and maybe a piña colada … or two)! 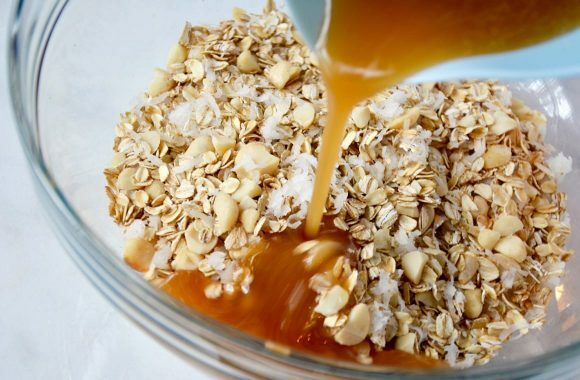 This quick and easy recipe starts with a quick toast of the oats and nuts to bring out their big flavors before stirring in shredded coconut to form the base of your dry ingredients. And in the spirit of simplicity, your wet ingredients can be counted on one hand: honey, oil, egg whites and vanilla extract. The egg whites ensure your resulting granola is crispy, while the honey lends a touch of sweetness. Once you’ve combined the wet and dry ingredients, the granola goes into the oven until it has baked up golden brown. And then one it has cooled, all that’s left to do is stir in the dried pineapple, which I’ve chopped into pieces to ensure a bit of chewy sweetness in every bite. Enjoy a handful of granola as a snack or serve it up with your choice of yogurt, milk and fresh fruit for a power-packed breakfast. And if you’re a granola guru but prefer it on the go, don’t miss my favorite Homemade Chocolate Chip Granola Bars! 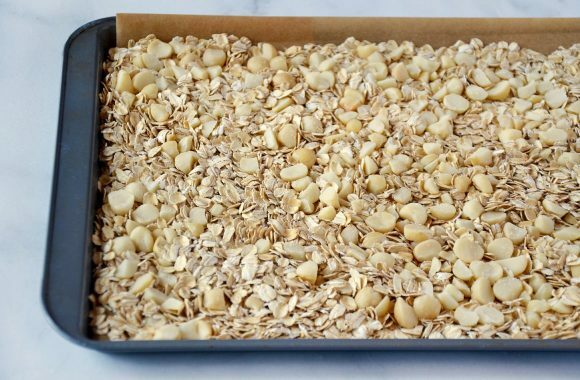 Spread the oats and macadamia nuts on the baking sheet, mixing them to combine, and bake them for 10 minutes, stirring occasionally, until lightly browned. Transfer the toasted oats and macadamia nuts to a large bowl then stir in the flaked coconut. In a separate medium bowl, whisk together the honey, vegetable oil, egg whites and vanilla extract. Pour the mixture over the oats and stir until combined. Pour the mixture back onto the lined baking sheet, spreading it into an even layer, and bake it for 30 to 40 minutes, stirring every 10 minutes, until it’s golden brown. 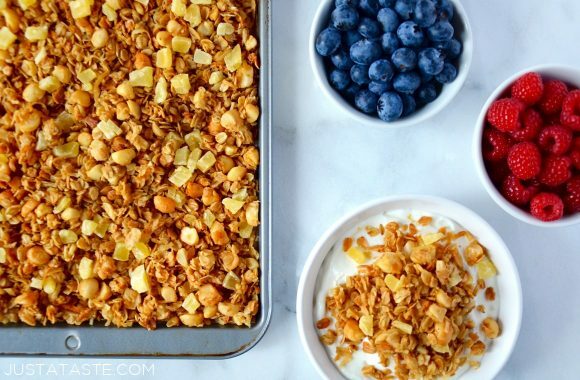 Remove the granola from the oven, stir it one more time then allow it to cool completely on the baking sheet. 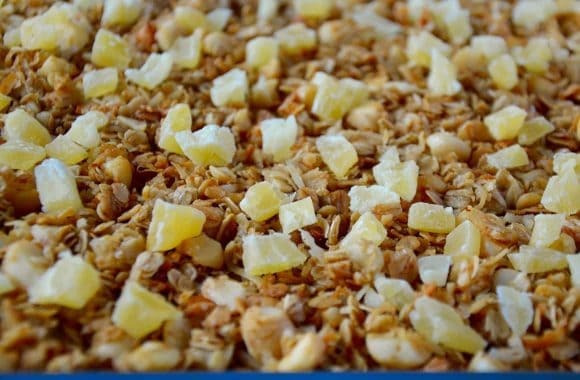 Once the granola has cooled, stir in the dried pineapple and serve it immediately or transfer it to an airtight container and store it for up to 2 weeks at room temperature.